Is it wise to introduce social media as a means of marketing your veterinary practice? How much time should be devoted to improving your existing social marketing strategy? The information in the blog, sourced from CM Research, will help you make an informed decision. While there is no statistic to suggest how many veterinary practices use social media as a form of marketing in Australia, it can be estimated that approximately 70-75% of veterinary practices use social media(based on data from We Are Social). As a point of reference, in the UK and the USA more than 80% of practices used social networking to advertise and/or promote their services. It does seem that one factor influencing whether or not a practice utilizes social media is the average size of the practice. However, in countries like the US, UK and Australia, where social media is already well established, its use has become widespread even in the smaller practices. To illustrate this last point CM Research took a closer look at the UK. Overall 81% use social media to advertise or promote their practice. 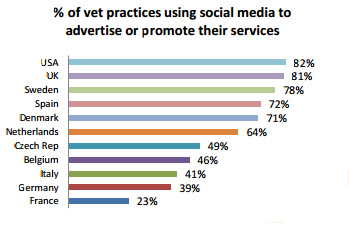 There is very little difference between practices with under 3 vets (21% using social media) and those with more than 3 (18% using social media). There is also very little difference by number of patients seen each day. This indicates that in most cases social media has almost become a given, something that has to be done that does not necessarily bring a competitive advantage. Where we did see some differences, although small, was when we looked at how vets spend their time in the practice. Those that are heavier social media users tend to spend more of their working week in admin chores, which makes sense, as someone needs to manage the social media accounts. There is also evidence to suggest that social media demands about an hour a week. In another group it seems that they manage social media “out of regular hours”, but only when it’s updating Facebook. If you want to kick start your vet practice’s social media networking Petplan has put together a “Get Social Kit” for all IVC Vet Practices. It includes everything you need to set up your own Veterinary Practice Facebook page. To find our more contact your BDM or the Petplan Customer Service Centre and ask how you can get your very own “Get Social Kit” for your Vet Practice. This information was taken from the research article “Use of Social Media in Veterinary Practices” which was published by CM Research. For more details on CM Research and their Research Article collection please visit www.cm-research.com. This Blog was written by the furry family at Petplan Australasia. Petplan Pet Insurance specialises in animal and animal industry insurance. Our practices keep the role that pet insurance plays in responsible pet ownership and the health of the pet at the forefront. For tips to keep your pet healthy, make sure you follow us on Facebook.